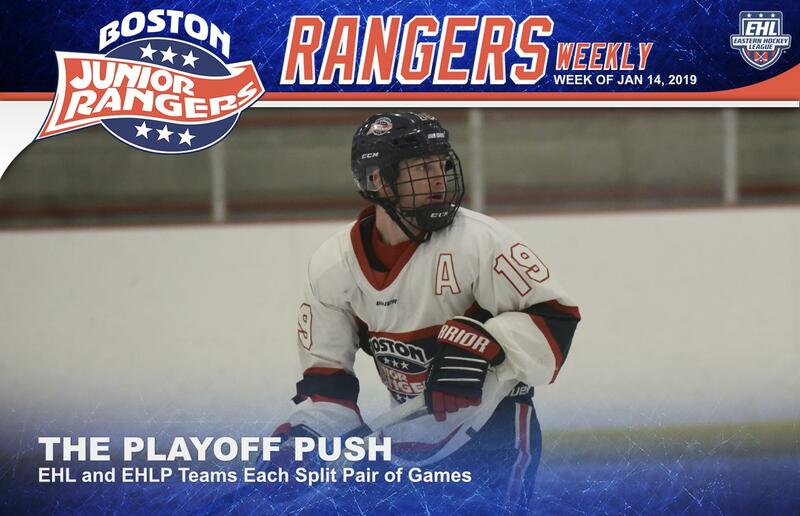 TEWKSBURY, MA -- Both Rangers teams kicked-off the second half of their seasons this past weekend, as the EHL team went 1-1-0 at the final league-wide showcase of the year. After the weekend, the EHL squad still sits in 2nd place in their division with a record of 18-9-3, just seven points behind the 1st-place New Hampshire Avalanche. The EHLP squad on the other hand won their matchup this past Saturday, but dropped their game on Sunday. Despite their shootout loss, the Premier team jumped the New England Wolves and are back at the top of their New England Conference with a mark of 24-3-3. On the first day of the January Showcase, the Rangers squared-off against the New York Applecore for the first of two meetings against the cross-conference opponent. The Applecore got on the board first with a power-play goal around nine minutes into the contest. However, Clay Ellerbrock answered quickly for the Rangers with a goal just 43 seconds later, to even things up at one goal a piece. The Applecore fired back with a pair of quick strikes to take a 3-1 lead, but Cam Roberts cut the deficit in half with around eight minutes left in the frame. Danila Larionovs then found the back of the net on the power-play a few minutes later to tie the game up at 3. Roberts scored again two minutes after that to give the Rangers their first lead of the game. It wouldn't last long though, as the Applecore scored just 30 seconds later to make it a 4-4 game. After a wild 1st half, the game remained scoreless until the 12-minute mark of the 2nd half when Conor Leonard broke the tie with his 5th goal of the season. Both Connor Galloway and Zach Norby added a pair of insurance goals near the end of the game, and the Rangers won by a final score of 7-4. Billy Girard stopped 23 shots for his 7th win of the season. On day #2 of the showcase, the Rangers faced-off against the Wilkes-Barre/Scranton Knights, a team who they lost to back in September. The Knights struck first just over two minutes into the game, and then added another goal near the end of the half to take a 2-0 lead. Larionovs made it a 2-1 contest in the 2nd half, but it unfortunately wasn't enough, as the Rangers fell by a final score of 2-1. Aiden Curry stopped 18 shots in the losing effort. The EHLP team returned from the holiday break with an important divisional matchup against the New England Wolves in Laconia this past Saturday. Going into the game, the Rangers and Wolves were both tied for the top spot in the conference. Dennis Engelson put the Rangers on the board first, with a goal just over eleven minutes into the contest. Just over a minute later, Jake Brown gave the boys a two-goal advantage. Luke Marsh then found the back of the net for the 20th time this season around the 13-minute mark of the 2nd frame, and put the Rangers up 3-0. The Wolves would get on the board later in the period, but the Rangers took a 3-1 lead into the final frame. Both Engelson and Josh Barton added 3rd period goals as the Rangers cruised to a 5-1 victory. Bobby McCloskey was terrific in net, stopping 32 shots for his 12th victory of the season. On Sunday, the Rangers squared-off against the Connecticut Chiefs for the second time this year. The Rangers won the first meeting between the two teams back in early December, and still have four more meetings left to play against their conference opponent. Sunday’s game got off to a rocky start as the Chiefs took the lead just 24 seconds into the matchup. However, Matt McPherson got the goal back on the power-play a few minutes later, tying up the score at one apiece. Levi Hensley put the Rangers up by a goal near the 16-minute mark of the second frame, and then McPherson found the back of the net for the second time a few minutes later to give the Rangers a 3-1 advantage. However, the Chiefs would rally from the two goal deficit and forced the game to overtime. After a scoreless overtime period, the Chiefs ultimately took the extra point in the shootout. The EHL squad will get back to work this upcoming Friday with an important divisional matchup on the road against the 1st-place New Hampshire Avalanche. On the other hand, the EHLP team will head down to Pennsylvania this weekend for their final league-wide showcase of the season. The weekend schedule matches the Rangers up against the Philadelphia Little Flyers on Saturday, followed by a game against the Philadelphia Revolution on Sunday.